Several airlines such as British Airways and Emirates still require female cabin crew to wear make-up while working, although in 2016 British Airways did drop its rule that women could not wear trousers. 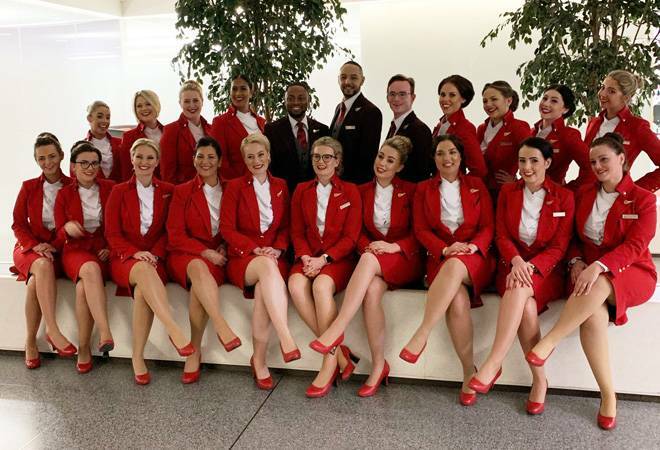 Virgin Atlantic female cabin crew are to be allowed to work without wearing make-up, the company announced, and will be able to wear trousers as a standard option in their signature red uniforms. Previously trousers, although permitted, had to be specially ordered from the airline's uniforms department. "Not only do the new guidelines offer an increased level of comfort, they also provide our team with more choice on how they want to express themselves at work," Virgin said in a statement. It added: "Female cabin crew are no longer required to wear any make up, if they so choose. They are however, still very welcome to wear any of our existing palette of make-up (including lipstick and foundations) set out in Virgin Atlantic's guidelines." Trousers are now available as an option for all women and will be provided as standard when joining Virgin Atlantic, it said. The changes come after feedback from employees of the airline, and as some of its newer competitors are relaxing traditional cabin crew uniform rules.